Bringing change in teams is hard work. Bringing change to organizations is hard work. Bringing change to compananies is really hard work. And almost impossible. Bringing change is about persistance rooted in strong belief in core principles. It is also about improvization. Listening and reflecting. This allows you embrace the problem, not the solution and bring about the real change needed. 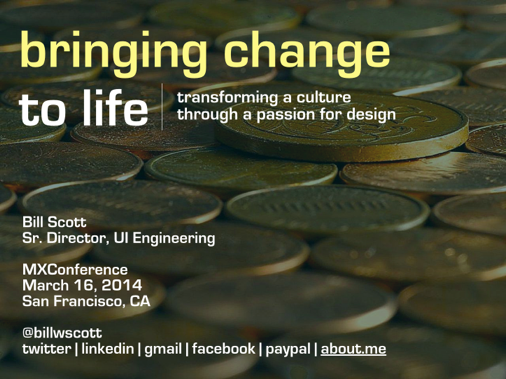 Here is the talk I just gave at the MXConference 2014 on Bringing Change to Life. Based on the response from the attendees, I believe this talk is actually applicable to bringing change to all sorts of organizations. Note. In my preamble to the talk I make it clear that we are still in the midst of change. PayPal has had to pay down a tremendous amount of technical debt and we are on a journey. The final judgement of the change will be our customers. This keeps us focused.